St. John, Marquis of Bessacarr, and Jason, the Duke of Torquay, have been in competition for years. The former values his reputation and resents it when Torquay, The Black Duke, taunts him that in a few years, Bessacarr will be just as notorious. Both want to possess Regina. Neither man can conceive of her as out of their reach. She is, after all, a poor schoolteacher’s daughter, the niece of a merchant, and quickly orphaned for a second time due to her uncle’s untimely death. Moreover, she showed herself at the Opera on a night when no women but wannabe courtesans would dare appear. She’s fair game, and Torquay vows to have her. Before long, he’s using every trick in the book to secure Regina as his mistress. When she evades the coach lurking at her door, he resorts to drastic measures, convincing her uncle’s heirs that Regina is his discarded mistress–and pregnant to boot. Cast into the street with nothing but her grip and a bit of pin-money, Regina is quickly pulled into Torquay’s waiting carriage. The Duke’s Wager appears to have established its villain. However, the articulate, educated, and upstanding Reginia acts differently than Torquay expects. The young lady has unbridled faith in finding good in others and is convinced she could never sell herself, no matter how poor or friendless she may become. Something stirs in the rake. Could it be a sense of honor? Nonesense. It must be the love of a game . . .
Whatever the reason, he makes a wager with Regina: If she can find a way to get along, alone and impoverished, without succumbing to selling herself, then he will leave her alone. If she fails, he will be waiting, watching, and will claim his prize. Certain of success, Regina accepts–and seeks out the man her uncle had recommended, should she ever need help. When the beautiful woman that Torquay had been pursuing shows up on St. John’s doorstep, he can hardly believe his luck. Finally, he can beat his enemy. A second wager is quickly made: who will win Regina, Bessacarr or Torquay? The former–tall, dark and handsome–plays the gallant protector, bustling Regina off to his country home with his sister and cousin. The latter–slender, blond, and strangely angelic-looking–pursues her, watching from a distance and occasionally conversing with his query. 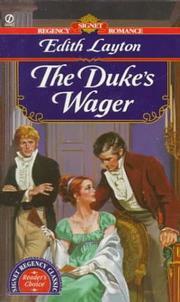 I read The Duke’s Wager (which could as accurately be called The Dukes’ Wagers) twice. The first time through, I struggled with it. I am not a fan of the “Reformed Rake” trope. On my second read, I was fascinated by the dark setting, bourgeois heroine, and carefully-rendered characters. All three leads have their flaws. Torquay has closed off his heart. Bessacarr hides his actions behind a facade of piety. Regina is out of touch with the harshness of the world and believes herself immune to compromising herself in any way. Layton tests all three, bringing them to their breaking points. “But,” she said succinctly as she rose to leave, “the love for a good woman . . . ah, that, my lad, would make all the difference in the world” (130). In this brief exchange, Layton skewers the time-worn trope (“reams of bad romances”) while exposing the only true path for a rake’s redemption: his own choices, actions, and generosity. At this point, I’ve spent almost a thousand words analyzing The Duke’s Wager, and my admiration for the book must be perfectly clear. I will only add a few more points in its favor: one or two strong secondary characters, a vivid setting, steamy scenes between the protagonists, and a truly satisfactory, tear-jerking ending. Don’t miss The Duke’s Wager.